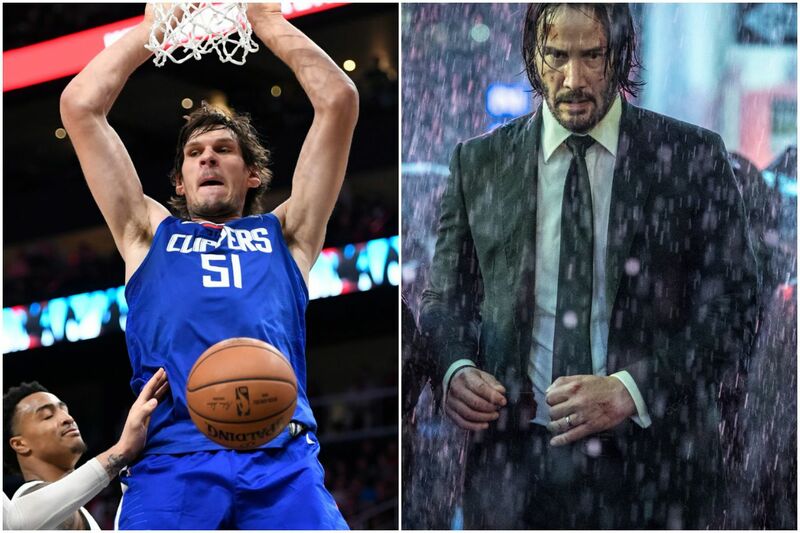 Boban Marjanovic does not find reading fundamental in the new "John Wick 3." The book on newly acquired Sixers back-up center Boban Marjanovic is that he can be an effective substitute for Joel Embiid in limited minutes off the bench. Less well known is that Marjanovic has a role in John Wick: Chapter 3 — Parabellum, a movie in which he apparently gets killed by a book. You can see the towering Marjanovic — who is 7′ 3″ and can dunk without leaving his feet — for a few seconds in the new John Wick 3 trailer, fighting star Keanu Reeves in what appears to be a library. Boban lands a kick, but things deteriorate from there, and he ends up with a book in his mouth, as the title character drives it through the back of his head. Teammate Tobias Harris, Marjanovic’s best friend and a player also obtained in the Sixers’ blockbuster trade with the Los Angeles Clippers, told the Los Angeles Times that Marjanovic is disclosing no details about the movie, even to buddies. “He’s not telling anybody anything, which is annoying,” Harris said. Teammates were impressed that Marjanovic was selected to be in the trailer. He’s told teammates all details will be revealed at the May 17 premiere. Parabellum is the third entry in the John Wick saga, following assassin Reeves as he tries to escape an international bounty put on his end at the end of John Wick Chapter 2. No other Sixers were reportedly harmed in the making of his film.